This book cover has 2 lines for the title, 1 line for the subtitle, 1 line for the author, 1 line for the hook, and finally 1 line for the genre. 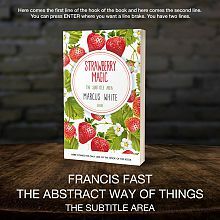 The most popular tags describing this Cookbooks, Food & Wine premade book cover are black, nature, design, summer and vector. Other keywords revelant to this premade cover are green, texture, natural, healthy, drawing, season, banner, frame, food, garden, sweet, white background, drawn, diet, round, organic, fruit, agriculture, eco, vitamin, cosmetic, product, dessert, aroma, tea, candy, cherry, berry, juicy, mix, chocolate, strawberry, juice, aromatherapy, raspberry, bakery, grocery, homeopathy, ice cream, filling, jam, black currant, berries isolated, berries background.